Where is it ? Sagres is located at the extreme western tip of the Algarve. 125 Kilometres from Faro airport about One hour forty minutes journey by car. How big is it ? 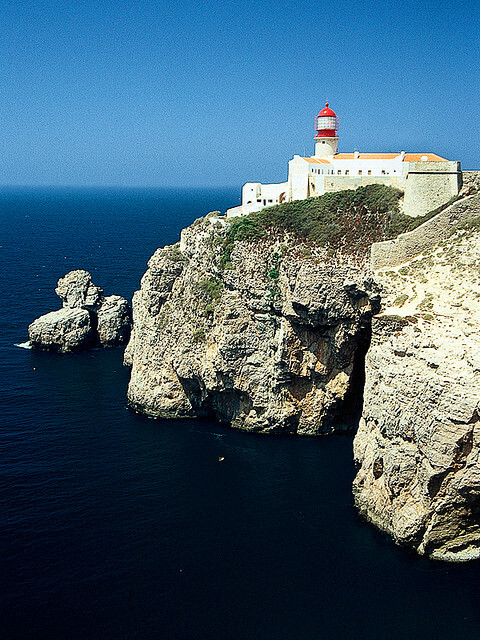 Sagres and Cabo do Sao Vicente are rural outposts and neither have large populations. Who goes there ? Mostly walkers, Surfers, People looking to find out the history of Portugal’s adventurers. Sagres in general does not attract a holiday crowd, during the summer however the beaches are popular with young Portuguese and there is a constant stream of Day trips to see Henry the Navigators fortress. What about Food and Accommodation ? There are several campsites around Sagres and Cabo do Sao Vicente but the lack of major hotels and apartments is part of the areas rural charm. Although not over run with eating spots there are still a decent selection around the main square of the town the Praca de Republica. There are also a good selection of beach cafes along the Praia de Mareta and praia de Martinhal. Sagres point is a windswept vista that earned its reputation as the window to the end of the world, hence its long association with adventurers and navigators. The town of Sagres itself, though small is pleasant with a central square lined with small bars and restaurants .The town attracts tourism and is seen as a nice quiet place for families and is popular with campers and walkers. During the summer the beaches around Sagres and Cabo de Sao Vicente get a large influx of young Portuguese visitors. Sagres and Cabo de Sao Vicente are windswept to say the least during the off-season, so not really suited to people seeking winter sun. The beaches around the town are a big attraction. The nearest and therefore most crowded beach is Praia de Mareta, only a five-minute walk from the Praca de Republica you can expect big crowds during the summer. Down by the Harbour area of Porto de Belixe you will find the more secluded Praia de Belixe. If you are willing to travel a bit further out past the cliff tops you will find the Praia de Martinhal a wide sandy beach backed by a lagoon and high cliffs. Here you will find a good selection of beachside cafes and the beach also has some good watersports activities to partake in. The Main street for eating and drinking in Sagres is the Rua Comandante Matoso. For more upmarket eating you will find a selection of excellent seafood restaurants with seaviews down by the harbour.